Continuing on with the second meal replacement shake review in our trio is Isopure from Nature's Best. This is one protein packed, potent meal replacement. With a slightly different focus from Myoplex, Isopure is for those of you who only care about one thing - gaining mass. The sheer amount of protein in one serving says it all, a whooping 50 grams! Okay, so flavor is a big factor for many bodybuilders when choosing meal replacements and other supplements. If great taste is important to you, then Isopure is not for you. But if all you care about is protein, protein, and protein, and weight gain, then give Isopure a try. Like everything else, Isopure comes in different flavors: vanilla, chocolate, orange, strawberry, and variety packs - but not too much focus is put into making it taste fantastic. Don't get me wrong, it doesn't taste horrible or anything, it's just that there are other better tasting alternatives on the market, that's all. Let's look at what's in a serving. Each box comes with 20 standard servings. Each serving of Isopure has 50 grams of protein (!!! ), 300 calories, 0 fat, and 25 grams of carbs. And that's pretty much it! Heck, why else would they call it "ISOPURE"? :) Because Isopure isn't designed for great taste (but for performance), it doesn't have a lot of 'fillers' like some other meal replacements do. Comparing its label to another, you'll see that Isopure has relatively few ingredients. Isopure meal replacement has phenylalanine in it. Phenylalanine is an amino acid that is essential in many bodily functions. It promotes mental alertness, elevates mood, enhances concentration, and suppresses appetite. 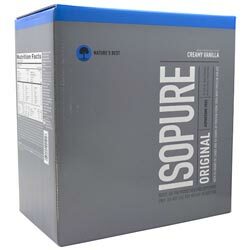 Isopure also uses 100% pure ion exchange whey protein isolate. That's a good thing if you didn't know. Read more on whey protein isolate in this article. Compared to other meal replacements on the market, Isopure is not cheap, but it's not that expensive either with its pricing sitting somewhere in the middle of the pack. For the amount of protein you get it's definitely worth the investment. >> Click here to purchase Isopure online and save!